Comet C/2018 Y1 Iwamoto reached its perihelion (minimum distance from the Sun), on 6 Feb. and tomorrow will have its fly-by with the Earth, coming as close as 45 millions of km. Here it is an image captured a few nights ago via the Virtual Telescope. The image above comes from the average of six, 300-seconds exposures, unfiltered, remotely collected with the “Elena” (PlaneWave 17″+Paramount ME+SBIG STL-6303E) robotic unit available at the Virtual Telescope Project in Italy. 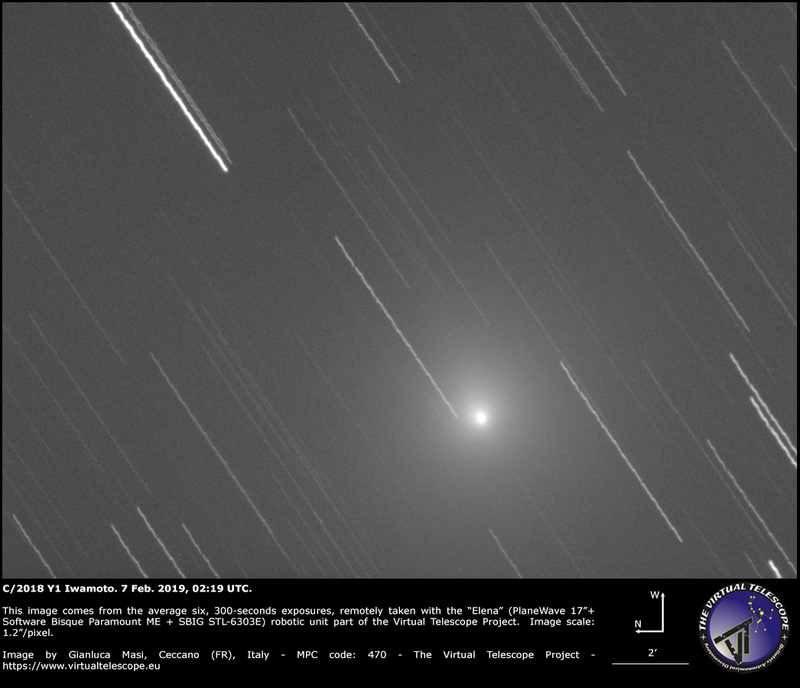 The robotic telescope tracked the apparent motion of comet C/2018 Y1 Iwamoto, so stars left trails on the background. The image scale is 1.2″/pixel. We will offer a live,online view of this comet on 13 Feb. 2019: join us!